The iPhone's record-setting average selling price (ASP) achieved last quarter continues an upward trend in iPhone pricing, led by growing popularity for Apple's premium-priced, more-fully-featured "Plus" models. The ASP is a benchmark of how much customers are willing to spend acquiring an iPhone from Apple or their carrier. The figure is worked out by dividing the total revenue Apple received for the product by the number of units sold to customers, with the number changing each quarter depending on consumer trends. According to Apple's quarterly financial results for the last five years, the ASP of iPhones ranged between the recently-achieved peak of $695 and a low of $561 in Q3 2014. Typically, the price stays above $600. Over the course of the last three years, the ASP peaked in the first quarter results —not coincidentally when new iPhone models launched —hitting $646, $687, and $691 in Q1 2014, 2015, and 2016 respectively. Between peak ASP levels, the average price drops down slightly towards the middle of the year, with an $85 swing by the third quarter of 2014, $95 in 2016, before climbing back up by the end of the year. In 2015, the price dipped by just $28 during the summer, with a 35 percent year-on-year iPhone revenue increase helping Apple post its highest ever June quarter earnings. The pattern of high ASP late in the year is attributable to a number of factors. It is the quarter that follows after Apple's traditional September refresh of the iPhone, and it is likely customers are willing to pay for a more expensive, higher-specification device shortly after the smartphone's launch. The holiday shopping season is another driver for hardware sales, and pressure to provide a great gift to a loved one may help push buyers to go for the more costly options. During Tuesday's results call, it was noted the latest ASP peak was driven by sales of the iPhone 7 Plus, with the premium device having a stronger demand than previous 5.5-inch-sized handsets. 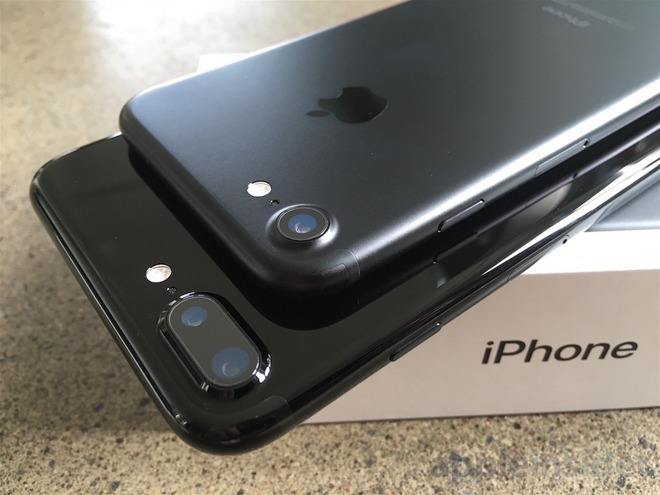 Apple Chief Executive Tim Cook noted the iPhone 7 Plus enjoyed a "higher proportion of new product mix than we've ever seen with Plus models in the past." While there is a noticeable pattern when looking at iPhone sales and the iPhone ASP, the same cannot be said about figures for some of Apple's other products. Similar data for iPad sales doesn't appear to show a pattern, with the average selling price dropping from its height of $614 in the first quarter of 2013 down to sub-$475 levels, though with a brief peak in 2016's third quarter bringing it back up to $490. As with the iPad, there doesn't appear to be any correlation at all between the ASP of Macs and the number of units sold. Apple tends to refresh its MacBooks and iMac ranges in two periods, covering spring and fall, but aside from a pattern of higher Mac unit sales during the fourth and first quarters, the ASP is seemingly uninfluenced by these product launches.